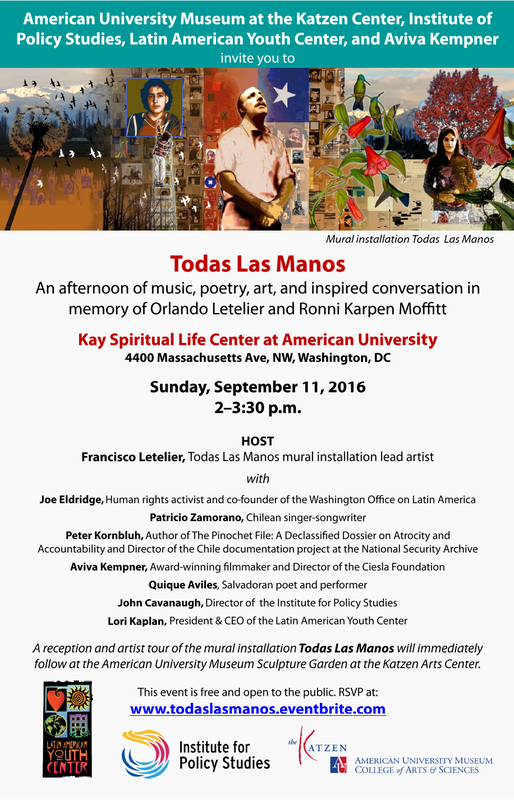 Todas Las Manos will immediately follow at the American University Museum Sculpture Garden at the Katzen Arts Center. I am writing to tell you about Todas Las Manos, (All the Hands) a public art project and mural installation I am creating at the American University, Katzen Museum in Washington DC during the month of August. The project commemorates the 40th anniversary of the deaths of my father, Orlando Letelier and his co-worker, Ronni Karpen Moffitt. My father was a faculty member at AU when he was killed. Todas Las Manos is part of several planned activities that will remember Orlando and Ronnie and the powerful legacy created in response to their murders on the streets of Washington DC in 1976. The project enacts and honors the principles and communities that brought Orlando and Ronnie together and acknowledges the vital community of support and solidarity created in the aftermath of their murders. Ronni was a schoolteacher and ran a program that made musical instruments available to all. Orlando was committed to social justice and democracy in Chile and to addressing hardship and poverty throughout the world. This commemorative project will celebrate human rights and global justice working with youth from the Latin American Youth Center in Washington D.C. For over 30 years the LAYC has served youth from all backgrounds throughout the area. It is incredible for me to return to Washington after 39 years to create a mural in collaboration with a diverse group of youth, many of them the same age as I was when I began this work. In 1977, for the first anniversary of the murders, the Chilean community with friends and supporters gathered at Rock Creek Park in Washington DC to create a mural. At that time, murals were outlawed in Chile. During the Allende government they had become a vehicle through which citizens were expressing their visions for a better world. Painted largely by ‘brigades’ comprised of artists and non-artists, in 1977, the murals had been whitewashed and muralists were considered terrorists. In exile, murals became a tool that helped create awareness and solidarity concerning events in Chile. The 1977 DC mural led to the creation of the Brigada Orlando Letelier/Orlando Letelier Brigade and with my brother Jose, artist Rene Castro, Turkish- American artist, Beyhan Cagri and others, we created solidarity murals throughout the United States and Nicaragua. As you know, the spirit of the Brigade continues to fuel my work as a public artist. I am looking forward to working with partners from the Chilean Embassy, the Institute for Policy Studies and Split This Rock, a national nonprofit organization of poets, artists and activists, as we establish curriculums for youth and the museum public when they visit the museum. Todas las Manos will have a textual component, using images and texts from declassified documents concerning the murders in Washington, US intervention in Chile and other places in Latin America. The documents will be used to create narrative threads, collage and visual texture throughout the installation. Prize winning documentarian Aviva Kempner will supervise the filming of the project. For the month of August I will be in ‘residence’ at the museum as we create the mural panels in the Katzen sculpture garden; during this time the public will have the opportunity to work on the project as well. The installation will then be on exhibit during September. Please consider forwarding this letter and the Todas Las Manos document to someone you think may be interested. Your help will insure that the legacy of Orlando and Ronnie continues to include the arts, culture and new generations as we seek social justice and new understandings concerning human rights. Please write or call me if you have questions, there are many more aspects I would like to share with you. Thanks for your long standing interest and support. Todas Las Manos fits in to other activities occurring in Washington DC in September. Currently, the Chilean Embassy has established a selection process for a sculptor to create a bronze bust of my father to be permanently installed in front of the Embassy on Massachusets Avenue. In September, an exhibit about the life of my father, created through the Museum of Memory in Chile will be installed at the magnificent Organization of American States building close to the White House and the National Mall. For the 40th year, friends of Chile and human rights will gather at Sheridan Circle, the site of the car bombing, and lay flowers at the memorial plaque installed along the curb. This year, Chilean President, Michelle Bachelet, will join the community in Washington DC at the Circle. President Bachelet will also be present for the Letelier Moffitt Human Rights awards. The awards have acknowledged heroes of human rights activism for four decades and continue to help identify key struggles, individuals and organizations that deserve support. It is also likely she will visit the Todas las Manos installation. who left Chile and gained entry and citizenship in the US. It also means that the men involved in the murders of Orlando and Ronni who have evaded justice may wonder if their day of justice is yet to come.